According to Vastu Shastra, the lord of ‘Agni’ (Fire) prevails in south-east direction. So ideally the kitchen should be located in south-east of the home. The second best option is north-west part of the home. The stove should be placed in south-east direction of the kitchen so that the cook may face east direction while cooking. 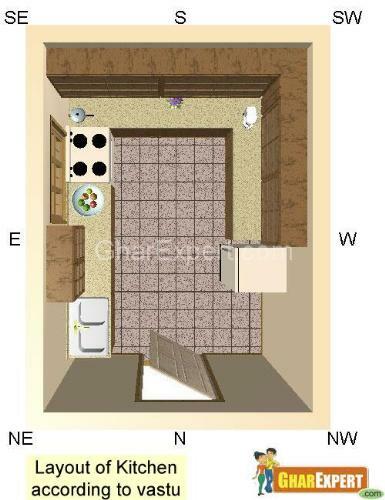 East quadrant is considered an excellent location for kitchen because this area brings prosperity. South-east is the best direction for the kitchen. North quadrant is second option and north-west is direction. In diagonal plots, avoid north quadrant which has ill effects on female members. West quadrant gives average results for kitchen. The kitchen should not be placed under or above Pooja Room, Toilet or Bed Room. 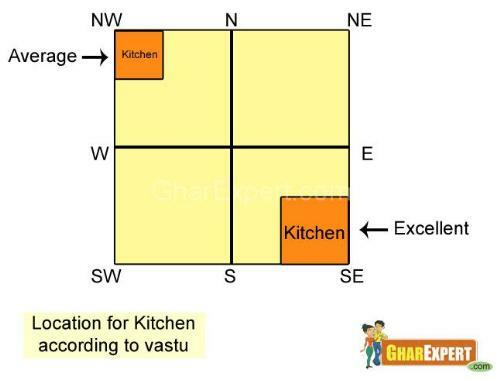 Let’s discuss the directions of various items of the kitchen. The Entrance: Entry door of kitchen should be in the East, North or West. The door of kitchen should not be in any of the corners. Cooking Gas: The gas stove should be in southeast corner, a few inches away from the wall. It should not be in front of the main door of the kitchen. Gas stove or any other cooking material should be placed in such a way as allows the cook to face only towards the East while cooking. If the lady faces west while cooking, it may lead to health problems. Cooking with face towards the south may lead to financial problems in the family. No shelf should be placed above cooking gas. The food should never be served at the dining table placed in the center of the kitchen. Dining table should be placed in north-west corner of the room. One should only face towards east or north while taking food for good digestion. Gas Cylinder: Gas Cylinder should be kept in south-east. Empty Cylinder should be kept in south-west. Refrigerator: The direction of refrigerator should be in south-east, south, west or north direction. Refrigerator should not be in north-east direction. If the refrigerator is in south-west direction, it should be a feet away from corner otherwise it always gets out of order. Electric Equipments: Heaters, conventional ovens, micro-waves ovens should be placed in south-east or south side of the kitchen; never in north-east portion. Sink: Sink (wash basin) should be in north-east corner as far as possible. Storage: The storage racks should be made on southern or western wall Essential commodities like boxes of grain, spices, pulses, etc. should be in south or west direction. The water source including pitcher, water filter, etc. may be kept in north-east. Flooring: Ceramic tiles, mosaic, marble are good choices for kitchen flooring. Ceramic tile flooring is recommended to accommodate Indian conditions as it is stain-free, dust-free and scratch resistant. Windows: There should be one or two windows or air holes in the east direction of the kitchen. An exhaust fan in the East is good. Color Scheme: The color of floor and walls should be yellow, orange, rose, chocolate or red. It should not be black as far as possible.